Given the fuzzy nature of services, it proves challenging to describe precisely what element of a renewed service offering can be regarded as innovative. Many existing characterizations are criticized for being too limited to capture distinctive features of new services accurately. 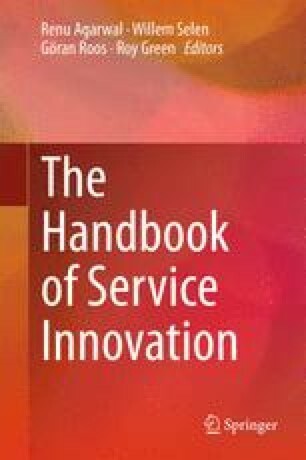 This chapter describes the possibilities offered by a multidimensional approach to service innovation. Adhering to differentiated frameworks of where novelty can occur allows for comprehensive measurement and comparative analyses across sectors. Additionally, a multidimensional approach provides a basis for the application of system and complexity theory to service innovation. The rich but largely unexploited potential of this perspective is illustrated by testing a hypothesis regarding the relation between radicalness and innovation performance. Using survey-data from 341 firms, we operationalize a multidimensional conceptualization of service innovation and show that firms renewing a higher number of dimensions indeed tend to yield a higher percentage of their turnover from innovation. Further implications of treating services as multidimensional systems are discussed.